Home Android APKs 10 Best Equalizer Apps For Android | Get Equalized!!! Do you need your sound or your favorite music equalized? then take a sneak peak at my list of nothing but the Best Equalizer Apps For Android. Equalizer apps are very important to those that listen to music almost every day, they need the sound to be equalized so that whatever song they play is just going to sound amazing. Equalizer apps on Android are not expensive, very affordable via Data connection, and they are all free, no paid equalizer apps on my list of the Best Equalizer Apps For Android. Now, apps like this might be more beneficial to musicians like pianists, Bassists, Lead guitarist, violinist, and even Cello players. So without further Ado, let’s dive in and see the 10 Best Equalizer Apps For Android I have in store for you. Like the name of this app says, Bass booster. It’s not just only an equalizer, but also a volume booster and a bass booster, meaning it’ll boost your bass and any other sound you set. It can also increase your phone’s volume from the regular 100% to a whole lot more. There is no doubt that you need this app on your Android device, so do yourself a favor and click on the download link below and download this app now. You can also customize your equalizer to look beautiful, there are a lot of themes that are in-built in the equalizer app, you can switch the themes to any color you want. Like I said in the intro. Equalizer apps won’t be that expensive to download via Data, this app is just 4.9MB in the installation size. MusicVolume EQ has a lot of cool features, the 3D virtualizer effect, amp, a stereo meter with led VU, bass boost and lots more. So, if you ain’t got a headset and earphones you can still enjoy real quality music from your Android device’s speaker, really cool features in this app just makes it easy for you to equalize your sound to whatever you might want it to sound like. You got the chance to use this app’s widget on your home screen to make it faster for you to access the app, 2 cool themes which you can use anytime, you can even enhance or boost the volume while equalizing a song. You can also use this app with a hi-fi headphone, and even a live wallpaper, the list of things this app can do just keeps going and going. All for just 6.6MB worth of download waiting for you now! with over 50 million downloads so far. The app Equalizer, can do a lot more for you than any other app, you might not need to access your music player and play any song from your music library and still need to equalize the song from the music equalizer settings or another app, you can simply download this app, equalize your sound and save. Whenever you open your music player and want to play a song, it will sound as you have set it to via this app. There are a whole lot of presets, all the basic presets are there and others you might have heard of, about 11 presets, and reverb presets, there is also a power mode button or option for you to use to disable or enable the effects you have set. You can create, edit, delete, reset, rename presets and many other powerful features that will help your equalizer app make your music sound unique. This app has over 10 million downloads and the size might vary on different Android device, but might be at the range of 4- 11MB of installation size. This equalizer FXworks well on the new Android versions, the Android Oero 8.0, Android Marshmallow, but might have a hard time working on the Android lollipop version. So, in order to make it work on point, you might need to access settings, go to applications and choose the option ‘all applications’, search and find the music FX app that is in-built in your music app, clear the data and go back to install your Equalizer FX. After that is done, go to your music app and as you choose your equalizer option, choose the newly installed equalizer FX app. This app, has a lot of presets, about 12, virtualizer effect, bass boost, loudness boost, and some cool widgets to add. This app is just 2.4MB in the installation size, over 1 million downloads on google play store. This app is good for headphones as you can see by the name, it has a headphone calibration and headphone correction feature, and you can also equalize your headphones online which is really amazing. This Headphones Equalizer can give you an amazing feeling, one of the best equalizer apps you will ever find. When using your Headphones Equalizer app, you will also need to get the best ear knobs for your headphone as well, just to get the perfect sound from your headphone. Some music players are not supported on this app, so the music players apart from your phone’s in-built music player, that can support this app are players like, Spotify, Google Play Music, Pandora Music, and most high-end players on google play store. This app is just 5.1MB in the installation size, with over 1 million downloads. Woofers are very useful and important when equalizing a sound, a good woofer can bring out the sound in a dynamic way. Woofer Equalizer is one of the best equalizers on google play store that has its reputation watered down. If you go to google play store and search for the best equalizer apps, you won’t see this equalizer app among the first top 10, even top 20 Best Equalizer Apps For Android. So that is why articles like this that we put up for you guys are very important, because we go fishing for the best, we even go further to download the apps ourselves and play around with them and see how good they work and bring out a list of the best so far, Woofer Equalizer totally deserves to be on my list of Best Equalizer Apps For Android. This app has over 100 thousand downloads so far, which is small, so you get my point, but the installation size is just 6.1MB. Use this Equalizer pro to boost and enhance your Android’s sound, and boost its equalizer capacity. You can also boost the volume of your music with the help of this app. Now I’m going to list out a few amazing features that this particular app has to offer. We got features like virtualizer, presets which are about 12, band equalizer which is about 10, a bass boost which is common in most equalizer apps, and also an amazing new user’s own presets, that can be customized by you. This app also works perfectly with most commonly used music players available on google play store. With over 500 thousand downloads, all the bugs, that affects most apps in general, were fixed in this app with the new upgrade, so be sure to enjoy a smooth ride through equalizing your sound. This app is just 2.4MB in the installation size. Not much is to be said about this particular equalizer app, but all you need to know for now before you download the app is the features that are going to make this app truly amazing and worthy of being on my list of Best Equalizer Apps For Android. This app has a really strong sound effect feature, supports a whole lot of music players, has a few band equalizers, virtualizer, bass boost, and more. The amazing thing about this app is that all the controls and settings are all in one screen, see it and customize it, all one after the other on the same screen. This app is just 1.8MB in the installation size, pretty low right? but effective. You are witnessing the most and best professional equalizer, with volume booster app for Android that you probably have ever seen. You know, I won’t just bring out all the amazing equalizer apps first on my list, I got to save the best for last, right? So based on some features of this app, let’s see what we got here. volume EQ is all set for you, adjust to get the sound you want form the music your playing, volume booster is also present, equalizer presets, bass booster, sound spectrum and a lot more features that allows this app to do the work it needs to do. This app is 3.7MB in the installation size, just over 1 million downloads. Now, I got this one special for you guys, a high-quality video player with an equalizer, The Best Equalizer that you probably have ever seen. most of my Best Equalizer Apps For Android are audio supported EQ, EQ that supports music players and helps you equalize your songs and get the right sound you want when you want to play a song from your Android device. This app is different, it’s a video player EQ, quite rare, but amazing. So after you have listened to some music from your music player on your Smartphone and you feel like watching a movie from your Smartphone or Tab, you can open this HD Equalizer Video Player and keep equalizing your sound. The controls to use this EQ are very simple, and other features to help you enjoy this EQ are all available and easy to use. This app is just 3.3MB in the installation size, your just a click away from it. 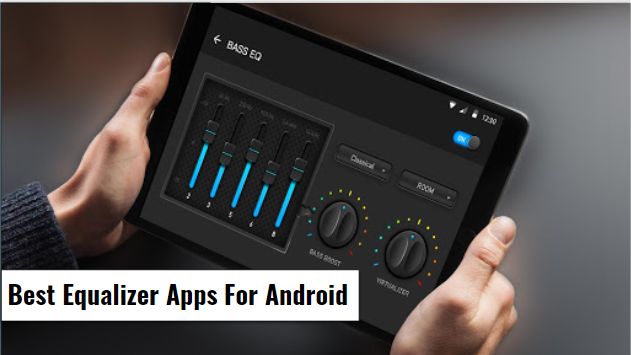 The Best Equalizer Apps For Android that will put a smile on your face are willing and ready on my list of Best Equalizer Apps For Android, you don’t want to go through this list without picking an app. This list is full of the best of the best that google play store has to offer when it comes to equalizers. There is not much to be said, any app you chose to download will serve you well, and will be suitable for any Android device. I think just a few are supported on some Android devices. Thank you so much for your time, till when we meet again, for now, see ya!